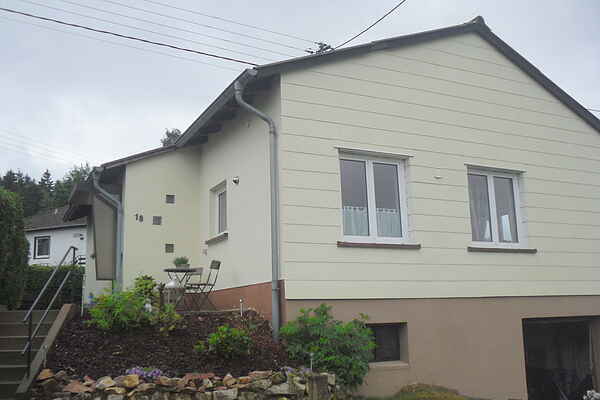 In beautifully green and forested Hünsruck, this spacious, fully equipped bungalow (2 to 4 people) is beautifully situated right next to the forest. The bungalow is equipped with every luxury so that you can enjoy a carefree holiday. Balcony and (spacious) south-facing garden, large living room with open kitchen, bedroom, bathroom with a bathtub and a garage with space for bicycles, motorbikes and mobility scooters. The ideal destination for nature lovers and peace seekers, but also for holidaymakers who want to combine rest with activity as there are several impressive cycling and hiking routes or fun excursions nearby. 4 km from Erbeskopf (at 816m, the highest mountain in Rhineland-Palatinate), 40km from the Roman city of Trier (Germany's oldest city), 20km from Idar-Oberstein (a city with a rich history of beautiful gems), 90 km from Luxembourg, 30 km from the river Moselle, 25 km from Bernkastel-Kues (historic centre on the Middle Moselle). The supermarkets, Aldi, Lidl and Rewe, are nearby (6km).